2) 1 big or 2 medium sized potatoes, quartered. 4) 2-3 tablespoons of Olive Oil –more if you like. 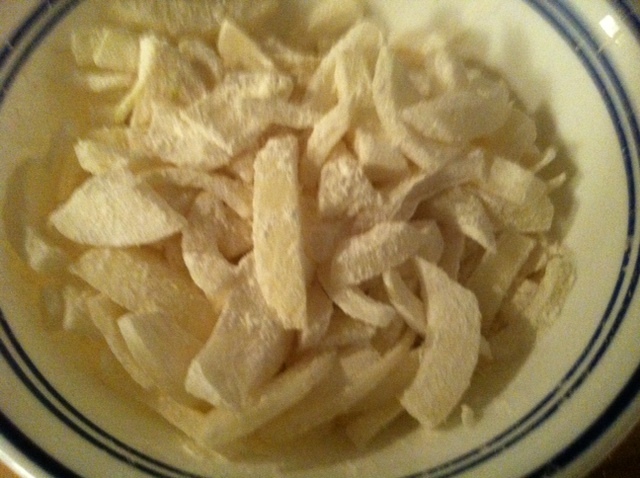 To start take ingredients 6-13 [the spices and the garlic and ginger], place in a bowl and add 1/2 cup of water. Leave aside. 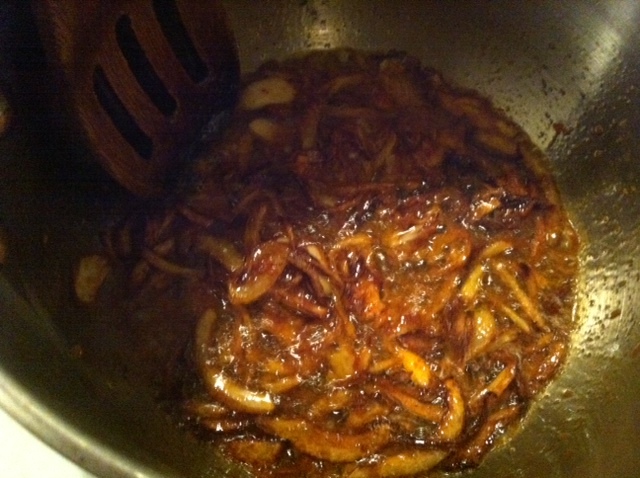 In a pan, under medium high heat, add the oil and the onions and brown. 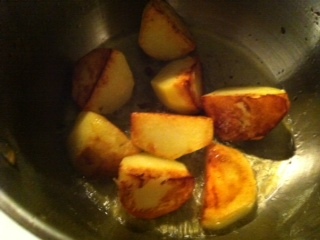 Then add the potatoes and sautee for a few minutes. Then add the spices in the bowl and turn the heat down a little and let boil for a few minutes, until the gravy/yellow sauce thickens. 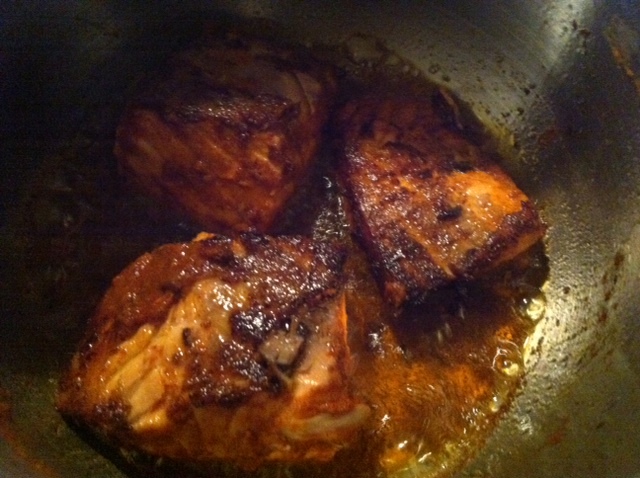 Then add the fish and fry in the spices. Turn once. Do not turn too much or else the fish will break. In my culture, it is a sign of a bad cook ha ha ha ! 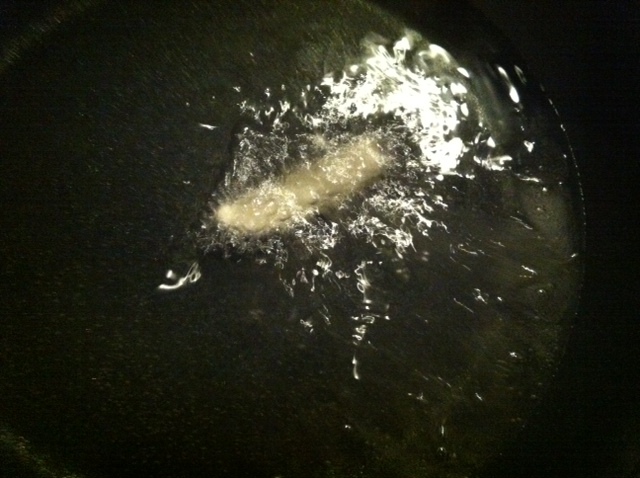 Once the fish starts turning white, add enough water to cover the fish. 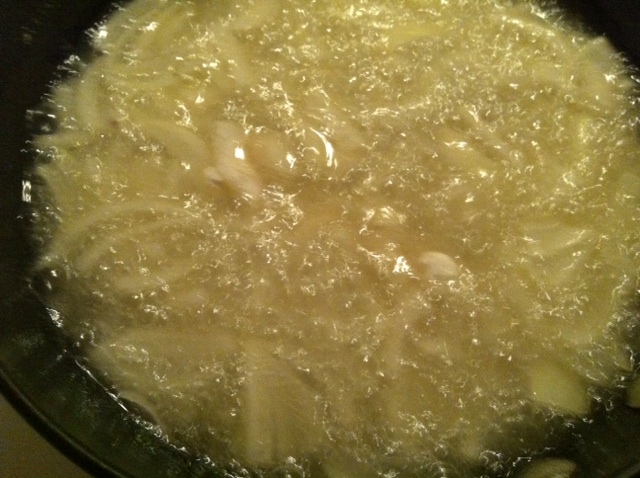 Add salt to taste and let boil until the sauce thickens to desired consistency. When it starts to thicken add the chilly pepper. 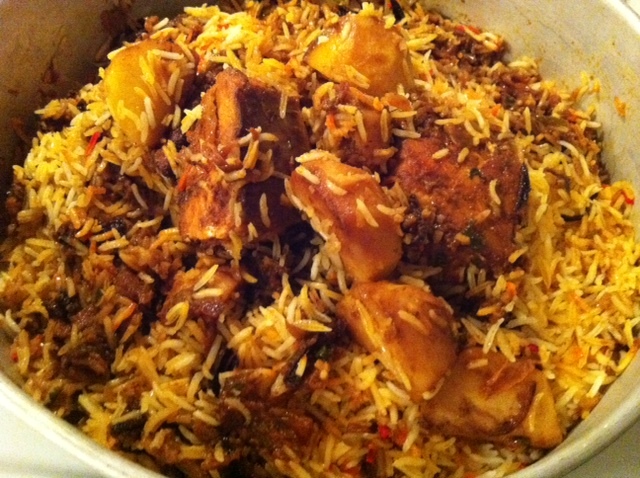 When it is ready garnish with the cilantro and serve on a bed of which rice, or rice cooked with lentils. 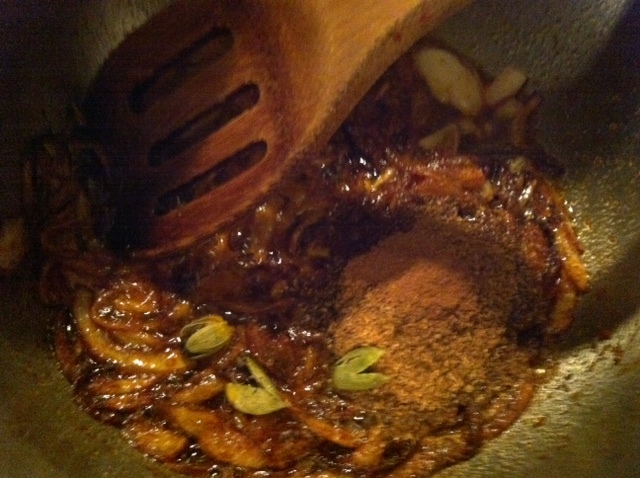 Alright let’s start, “Bismillah.” Place a frying pan under medium high heat and add the oil. 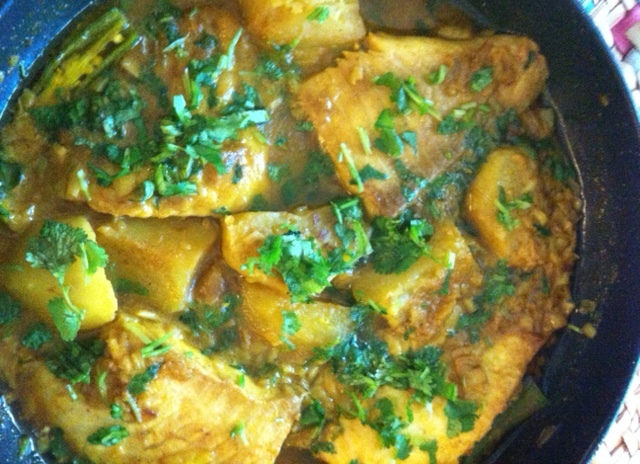 Then when it is hot add the fish and the fenugreek seeds. Let cook for 1 minute, then add the garlic, green chilly pepper, red chilly sauce, cumin coriander, salt, diced tomatoes and tomato paste. Add 1/4 cup water and shake the frying pan so everything is evenly spread out, or gently with a spoon mix [but be careful don’t break the fish]. Leave on medium low heat until the sauce thickens–I sometimes stick it in the oven at 350 degrees Fahrenheit until the sauce has thickened. 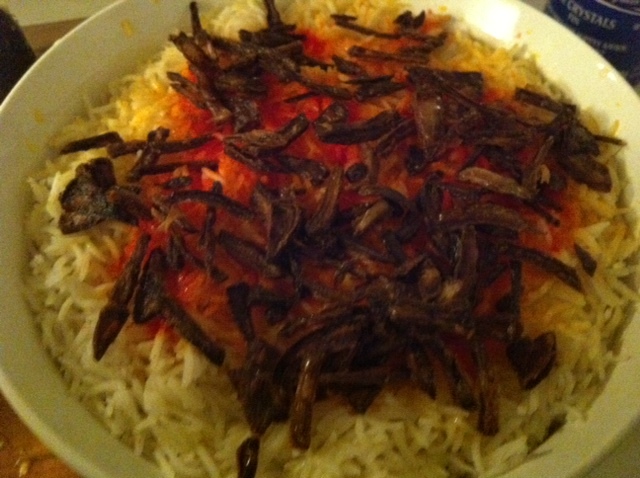 Serve with Khobz [South Yemeni bread] and Hulbah or on a bed of rice. Since Aden is a coastal region, we eat fish pretty much on a daily basis. 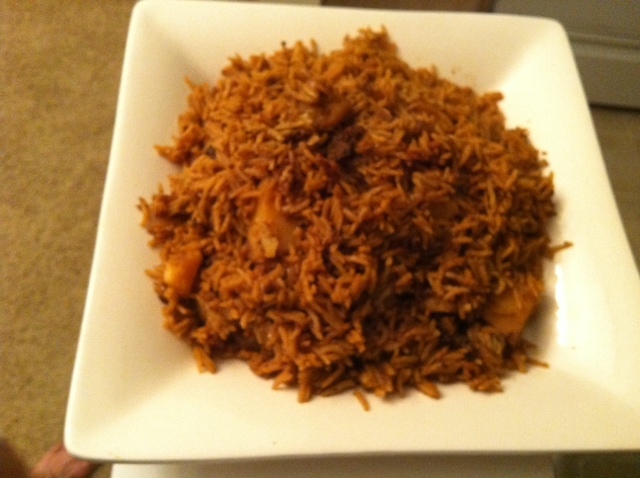 We also have many rice and fish dishes. This one is called “Sayadiyyah Hindiyyah” which literally means “Indian Fish and Rice” maybe because the locals picked it up from the Indian communities in Aden . It’s one of those dishes , that you have to make a lot of the components separately and then assemble and cook together for the grand finale. 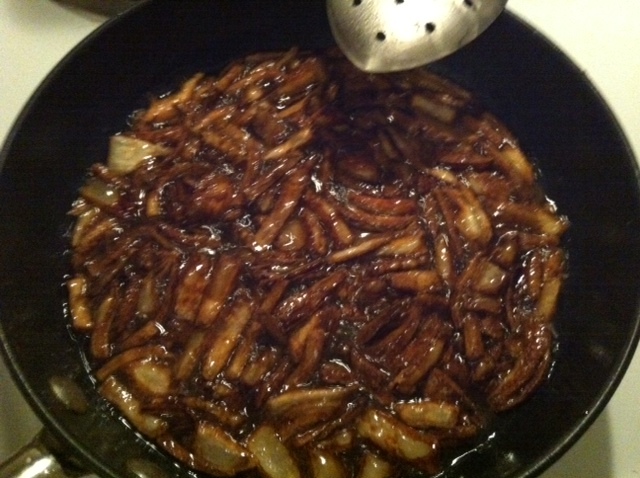 1) Fry a medium onion, by first cutting into slices, mixing in one tblsp of flour, and then frying in oil until browned. Take out and let drain of oil on a paper towel. Check if oil is hot! 2) Quarter a big potato and brown in oil [you do not want it to cook through, you just want it browned on the outside, so make sure the oil is hot enough. Take out and keep aside. 3) 3 pieces of salmon. Each piece was the size of my palm and about 3 fingers thick. If it’s very thin it can break easily. You want fish that will withstand the cooking. We also use King Fish for this dish, but I couldn’t find it fresh. 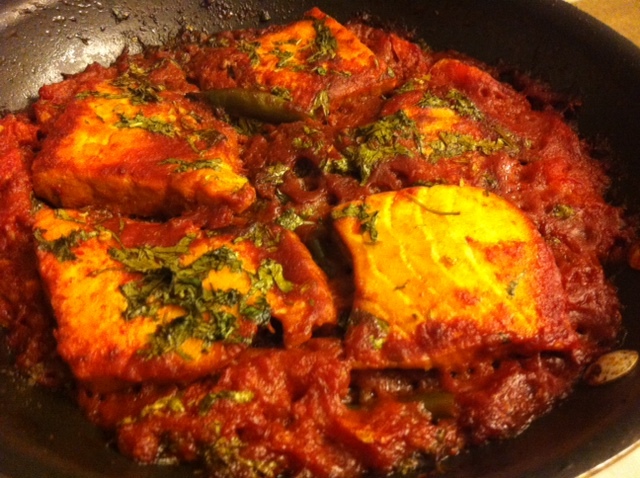 Marinate the fish in some red chilly pepper sauce [Bisbas Adani], 1/2 tsp of ground coriander, 1/2 tsp of ground cumin, salt to taste, 2 cloves of garlic finely minced. Fry the fish in 3 4 -5 tbslp of oil until browned on the outside. Take out and keep aside. 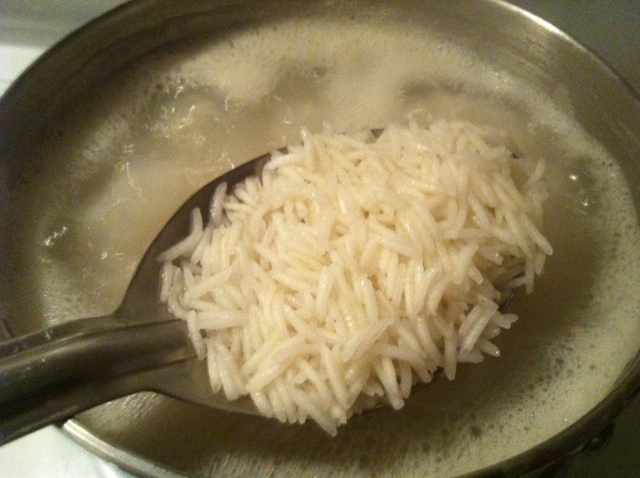 4) In the meantime, half boil a cup and a half of rice in salted water. Keep your eye on it, lest the rice cook through. Drain the water from the rice, and leave aside. 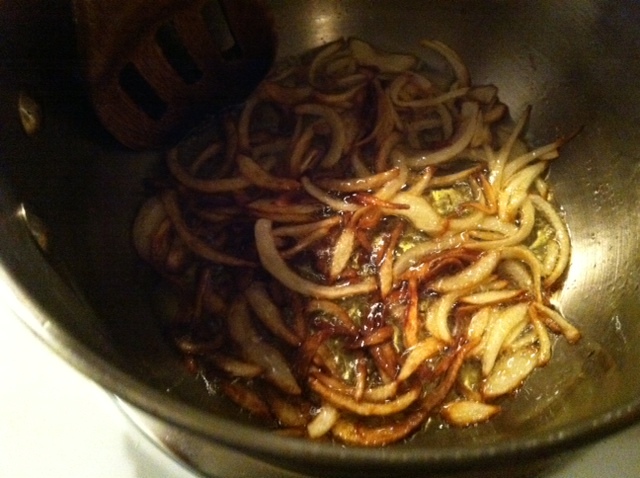 5) In a pot add 3 tbslp of olive oil and fry a medium thinly sliced onion until golden brown. 7) Add 2 cloves of finely minced garlic to the onion. 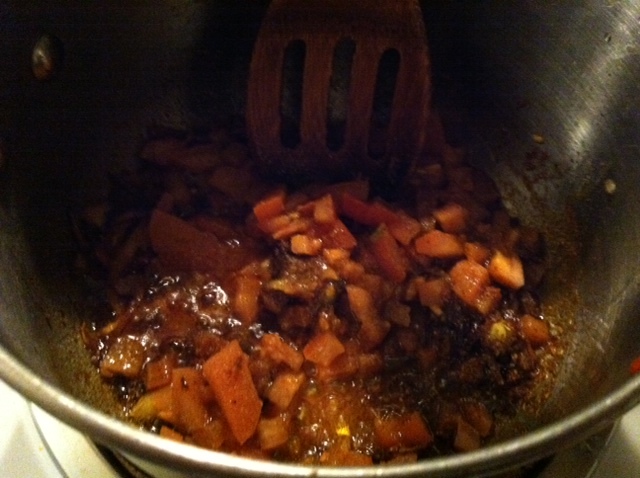 10) 1 tsp of tomato paste and let the sauce thicken. 11) Now it is time to assemble. 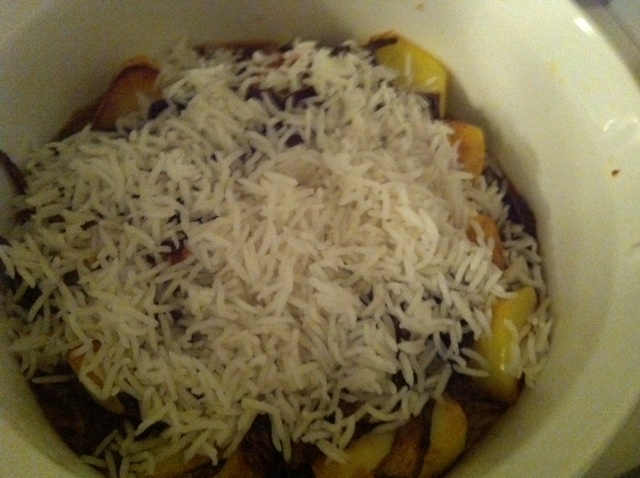 In an oven safe dish, first layer is the sauce. 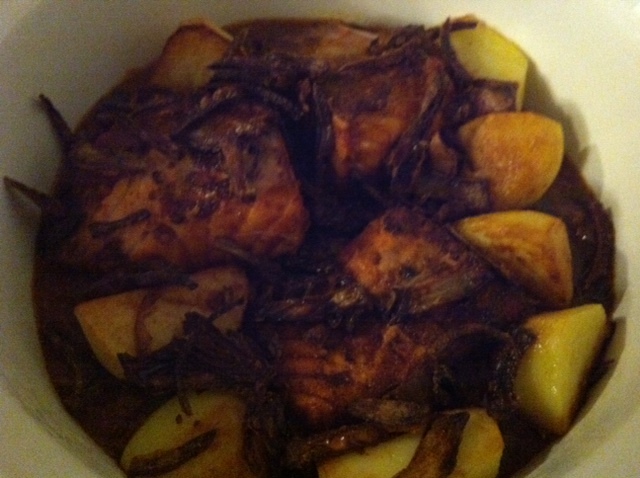 Arrange the fish on top of the sauce, then the potatoes and half of the browned onions. Then all of the rice comes on top. To finish it off, sprinkle some orange or yellow food coloring, a quarter of a cup of water, and 2 tbslp of olive oil on top. Cover with foil and place in 350 degree preheated oven for 30 minutes. 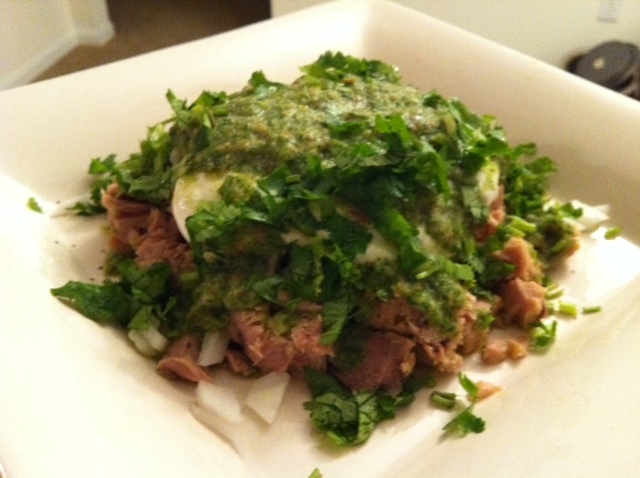 In a blender, place ingredients 7 through 10 with 1 tblsp of cilantro. 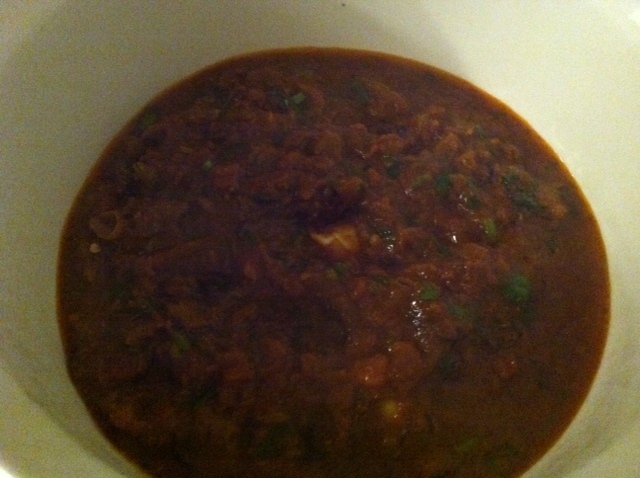 Blend well, will look like green chutney [condiment]. Place aside. Strain the oil or water from the cans of tuna. Arrange the tuna–in chunks– on a serving platter. 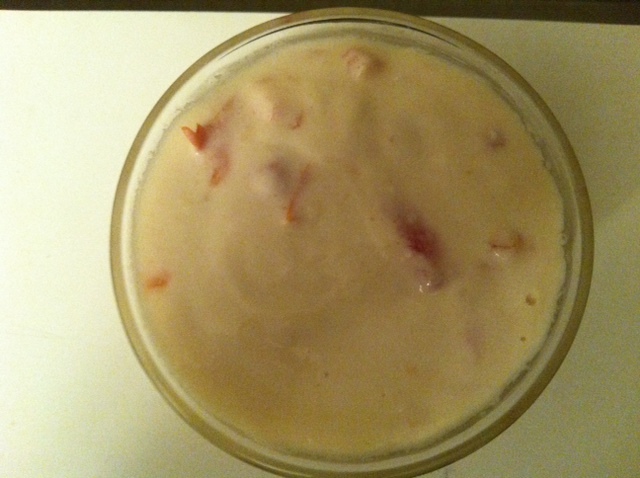 Whisk the yogurt with a dash of salt, until it is nice and smooth. Layer on top of the tuna. Spoon the green chutney [condiment] on top evenly. Garnish with the rest of the cilantro. Serve with warm pita bread. 2) 5 tblsp of red chilly paste–make your own by soaking some red dried Mexican chillies overnight and then process them in the food processor with a little water. Make sure its smooth. Mix ingredients 2-6 and keep aside. 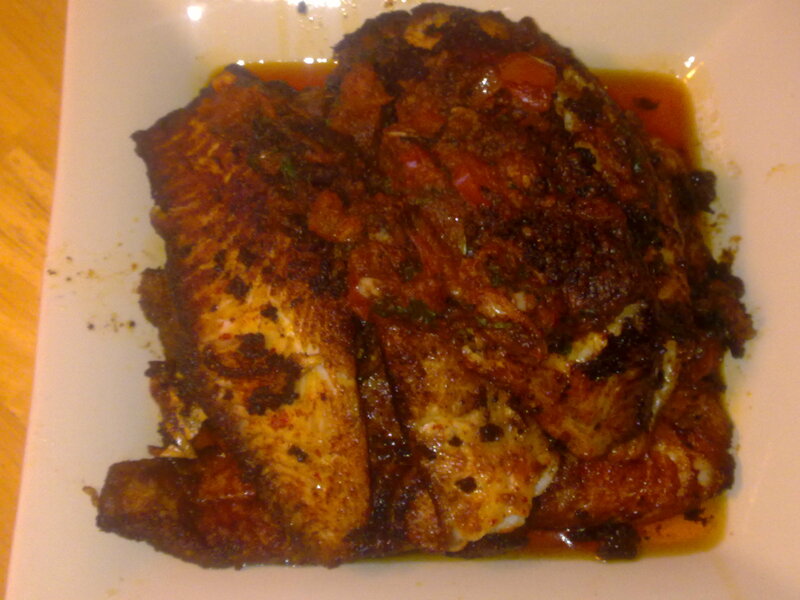 Wash the fish well with cold water and place in the red chillies, garlic and spice mixture. cover the fish well, and fry them. About 2 min for each Tilapia. In the remainder of the mixture, add the tomatoes and cilantro and place in the oil and fry until it thickens and then pour on the fish. Serve with bread. This was the best picture I could take before they were devoured. So, it’ll have to do until I make them again.You can stuff them into pita bread pockets with iceberg lettuce and the avocado salad, for a quick and delicious sandwich. 2) 2 4 oz.cans of gourmet solid white tuna, drained. 6) 1 jalapeno–finely chopped. Less if you do not want it to be spicy. 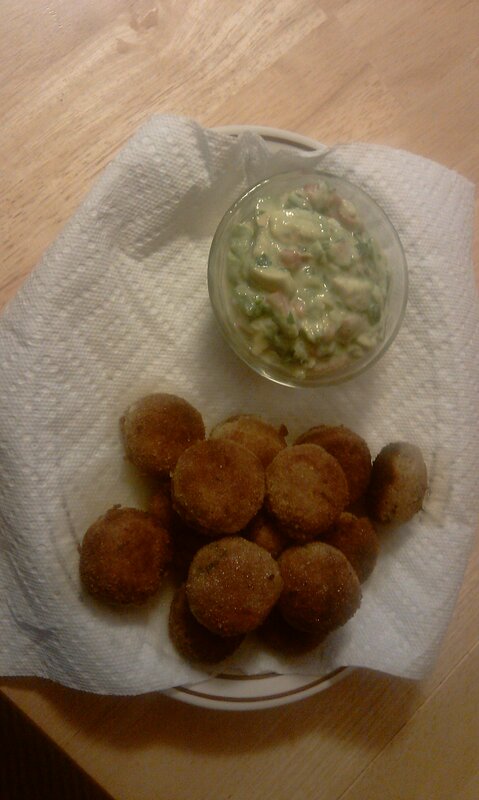 13) 1 tblp of unseasoned bread crumbs to mix in withe tuna patties. More for breading.